Sean Rafferty presents a selection of music and guests from the arts world, with vocal group Tenebrae performing live in the studio and harpsichordist Trevor Pinnock. Sean Rafferty with a lively mix of music, chat, and arts news. 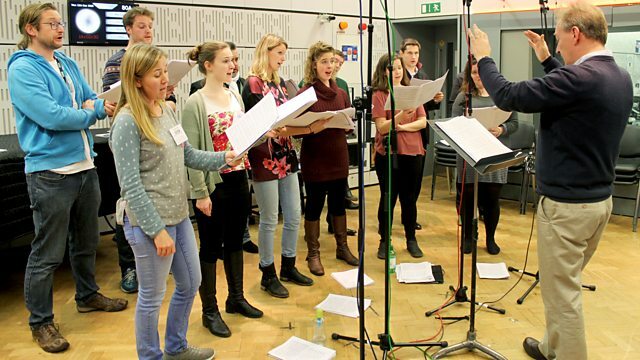 His guests include vocal group Tenebrae, who perform live in the studio, and harpsichordist Trevor Pinnock. Plus Alexandra Shackleton and Paul Frith discuss the centenary of Sir Ernest Shackleton's return from the Endurance exhibition and the new symphony Frith has written to commemorate it. Performer: Catrin Finch. Music Arranger: Catrin Finch. Singer: John Lee. Performer: Guy Newbury. Performer: Peter Whelan. Orchestra: La Serenissima. Director: Adrian Chandler. Vivaldi: French Connection 2: La Serenissima/Peter Whelan. Orchestra: Royal Philharmonic Orchestra. Conductor: Robert Ziegler. Debussy: Images, Jeux, La Plus que Lente. Singer: Emma Kirkby. Ensemble: Academy of Ancient Music. Conductor: Christopher Hogwood. Beethoven: The Complete Piano Sonatas. Performer: Robert Tear. Performer: Philip Ledger. Performer: Emmanuel Pahud. Performer: Trevor Pinnock. Orchestra: Kammerakademie Potsdam. Music Arranger: Arnold Schoenberg. Singer: Garteh Brynmor John. Ensemble: Royal Academy of Music Soloists Ensemble. Performer: Trevor Pinnock.